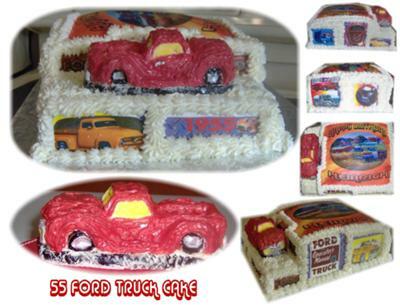 For this 55 truck cake, I made 3 9x13 German chocolate cakes filled with german chocolate filling. Then, I frosted them with vanilla buttercream with the star tip. I made the truck out of candy clay and hand painted it with red chocolate to build it up. I made edible icing sheets with different pictures of the 55 truck , manual, to personalize it. I had more fun trying to make the truck than the whole cake itself.